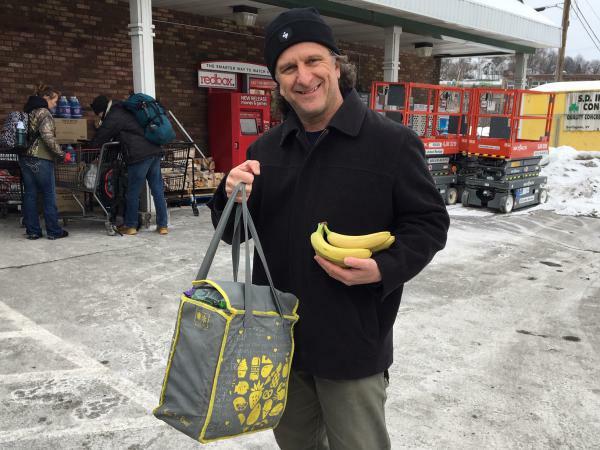 Vic Guadagno from Montpelier says it's easy to bring your own bag to the supermarket. Town meeting debate in several towns next week may turn to trash talk. Trash, that is, in the form of single-use plastic bags. Communities from Manchester to Burlington are considering measures that could lead to local bag bans. Lawmakers in Montpelier hope the town meeting votes will add momentum to their efforts to pass a statewide ban. A very informal survey of shoppers outside the Shaw’s supermarket in Montpelier didn’t turn up many fans of the ubiquitous throwaway plastic bag. Vic Guadagno set down his own reusable bag to talk to a reporter. In November, Montpelier voters overwhelmingly approved a resolution seeking a charter change to ban the sale of single-use plastic bags. Montpelier followed Brattleboro, which last year became the first Vermont town to prohibit the single use bags. Burlington next week will consider an advisory measure on the issue. Town Meeting votes will also be held in Middlebury and Manchester. Montpelier Mayor Anne Watson says the local activism helps show lawmakers that there’s support building for efforts to reduce plastic pollution. And action from the grassroots is exactly what Addison Sen. Christopher Bray wants to see. Bray chairs the Senate Natural Resources Committee and he’s sponsored legislation that would prohibit the plastic bags, forms of polystyrene food containers, and single-use plastic straws. Bray said legislative staff have looked at the issue statewide, and estimate that some dozen communities consider some form of bag ban by the end of the year. 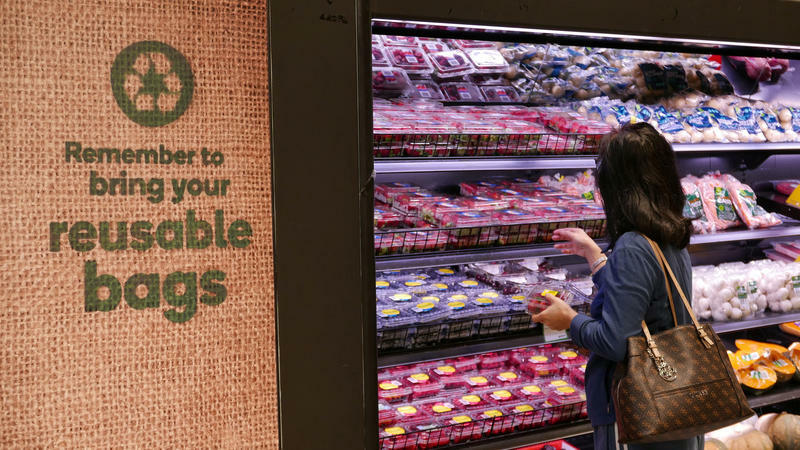 But an advocate for the state’s retailers and grocers said complying with dozens of different local ordinances would be a nightmare for businesses. Erin Sigrist, president of the Vermont Retailers and Grocers Association, said her members realize that a bag ban is likely coming. But they’d like to see it done statewide, not town-by-town. Sigrist supports a bill that’s now being drafted that would levy a five cent fee on paper or plastic bags. The bill also bans plastic bags in 2020, but would allow stories to keep the fee to cover the higher cost of the paper bag. Middlebury may be the next town to ban bags. Maggie Eaton has worked on the issue since last spring. She says she was surprised after moving back to Vermont from California that the Green Mountain State – known for its environmental activism – had not taken steps to limit plastic pollution. Eaton said the bags – made from fossil fuels – rarely get recycled, and thus break down into smaller and smaller particles that spread throughout the environment. They may not get recycled. But people do reuse the bags. And that’s why Montpelier resident Sheryll Rapaport is a bit ambivalent about a ban. Standing outside Shaw's, with yes, a reusable bag, Rappaport said she does think plastic pollution is a global problem. That tension between convenience and concern for the environment will continue to play out at the Statehouse and at town meetings on Tuesday. Copyright 2019 Vermont Public Radio. To see more, visit Vermont Public Radio. A western Massachusetts lawmaker has signed on to a bill to ban single-use plastic bags at stores statewide. Boston is close to banning plastic bags after a unanimous city council vote Wednesday. Several Rhode Island municipalities have also banned the bags, but some advocates make the case for a statewide ban. To cut down on waste from single-use plastic bags, some of Australia's largest retailers are banning them. And while environmental groups and many shoppers are applauding the move, implementing the change has been tense at times.